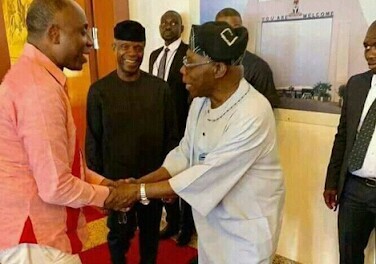 Former President Olusegun Obasanjo has asked the African Independent Television (AIT) to retract with apology, the airing of a photo on its social media segment, Kakaki Social, where a purported tweeter account belonging to him, depicted a picture of his alleged meeting with Vice President Yemi Osinbajo (SAN). Obasanjo added that he did not have Twitter account anywhere and expressed concern over the continuous use of his name by suspected fraudsters on social media platforms. “It is a fact that severally, the former President dissociated himself from owning any social media account. Therefore, it is highly disappointing that such sensitive Twitter post would be allowed to go on air without verification by the African Independent Television (AIT). “There was no meeting with the Vice President anywhere. I was at the airport and was informed that he was around in the Lounge and out of courtesy, I felt I should go and greet him. We met, greeted and exchanged pleasantries and I left. That was all. “The station should have been very professional and not causing confusion and heating up the polity. That I am not operating any social media account should not be strange to a station like AIT, and for that embarrassment, the Vice President and I deserve an apology,” Obasanjo said.